This year we have been to see so many productions at the theatre, they've mostly been musicals like The Addams Family or shows like The Lord of the Dance. But our most recent trip to the theatre was to see a play. We had no idea what to expect from Around The World in 80 Days and I was quite nervous about taking the boys to see a play. 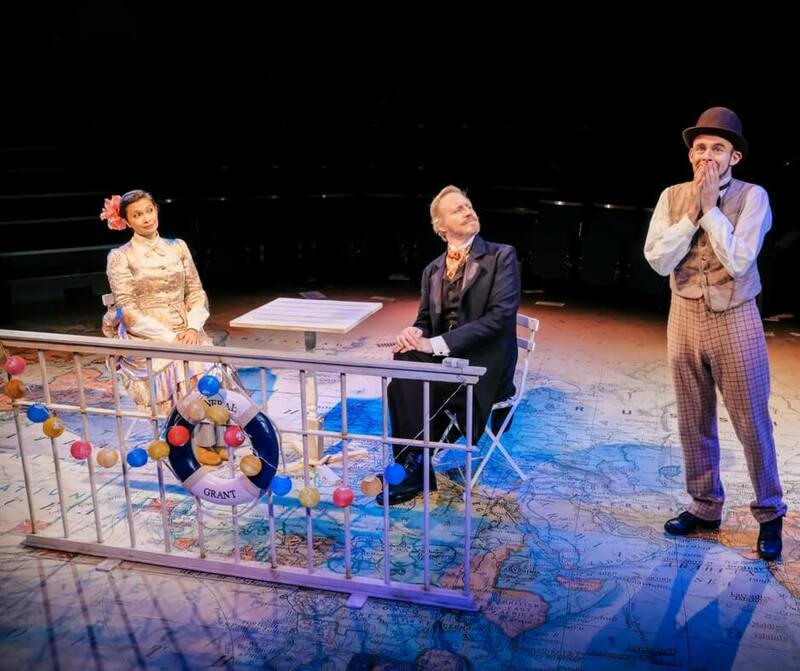 The mysterious and fabulously wealthy Phileas Fogg wagers his life’s fortune that he can circumnavigate the globe in just 80 days. 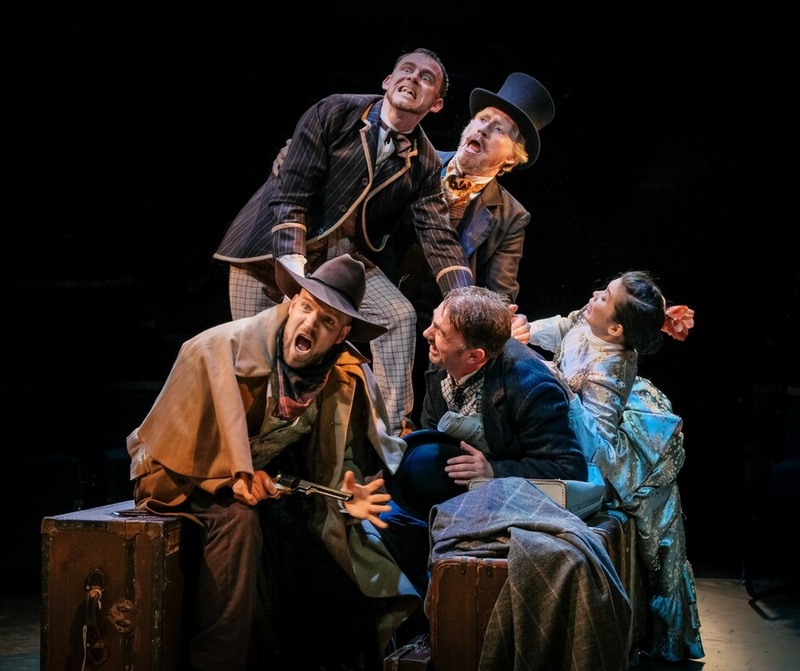 Join him and his loyal valet Passepartout, as they voyage from the misty alleys of Victorian London to the exotic subcontinent and the Wild West in a race against the clock. 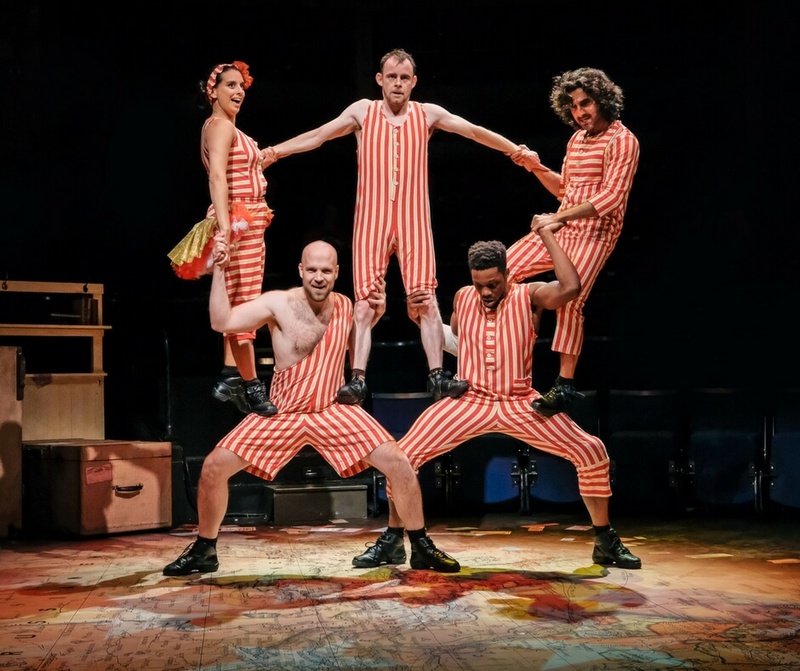 In Theresa Heskins’ celebrated production, a cast of eight play over 125 characters, embark on this imaginative, high-spirited escapade including six trains, five boats, four fights, three dances, two circus acts and an elephant! From about a minute into the play I knew it would be good, as soon as I saw Phileas Fogg sleeping in his bed... standing up. I needn't have been worried about the boys enjoying the play because it was so entertaining. We soon learned that Phileas Fogg was a character of routine, he did the same things day in day out. That is until he is challenged and sets off on a journey around the world with his newly employed valet, Passepartout. 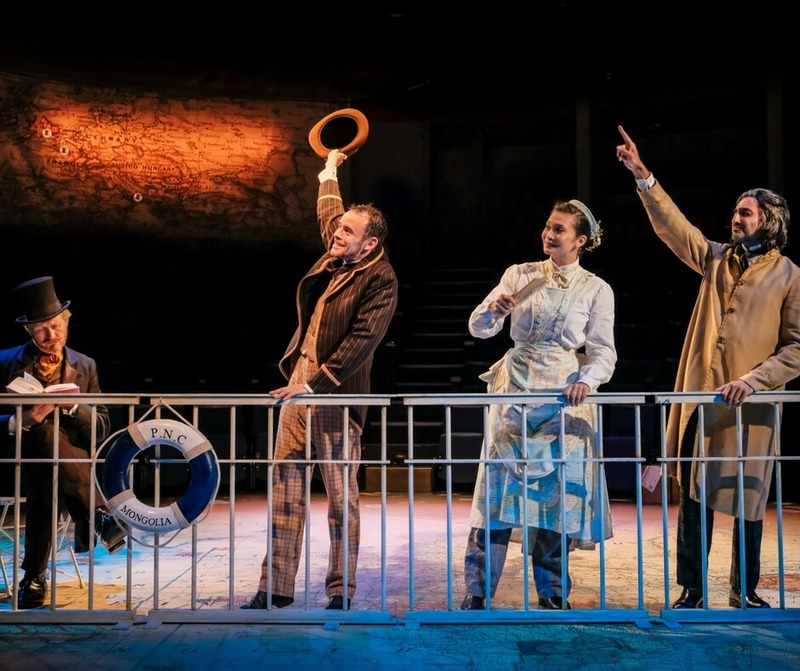 Around The World in 80 Days isn't just about a wager though, and that was the beauty of this play. It's about journeys. Journeys of friendships and journeys of the self. Phileas Fogg starts out as a 'matter of fact' person and likes everything done 'just so'. But as Phileas and Passepartout journey on boats and trains (and other things) around the world you watch Phileas change from a strict character to someone who has real feelings, you even get to see him fall in love. The friendships that blossom during the travelling are heartwarming, you see the characters begin to care for one another. They work together to fight against bad things that happen during their journey which brings them closer and by the end they're true friends. But that wasn't the only great thing about this show. The acting was AMAZING!!! Funny, entertaining, inclusive, it was everything I could've asked for in a show. There is some fighting in the play but it is done in such a way that you are stunned, I won't tell you how it's done because I don't want to spoil the surprise but it is THE BEST way to do fighting on stage in my opinion. There were brilliant parts when money was thrown across the stage from character to another, without ever leaving the first character's hands. You have to see it. There's gun fighting too, and Passepartout catches bullets in his teeth! The sets were simple and movable, in fact most of the set pieces were moved on and off stage by the actors themselves. The sides of the boats were obviously light but sturdy and the actors did a brilliant job of making it seem like they were actually on a boat by swaying from side to side totally synchronised. 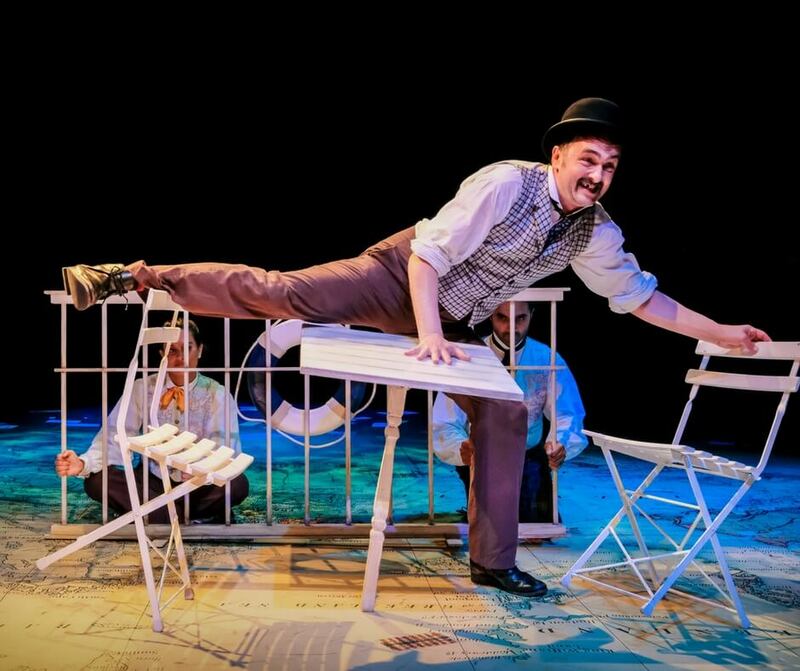 The detective was a brilliant character, here he is trying to keep the chairs and table swaying... alone. Despite Around The World in 80 Days being a play there was acrobatics too. After the intermission we were entertained by a circus group! They did flips and made a human pyramid, as well as a few other things I won't mention so as to not spoil it for you. I don't usually bother to mention the costumes in a show because, well to be honest, they're a bit 'blah'. Costumes are costumes, unless it's something amazing right? I couldn't write about this show without mentioning the costumes. To begin with I didn't notice it but a lot of the costumes were maps! Dresses made out of maps. Waistcoats with a map of the world all over it. I loved it. We sat, enthralled, watching Phileas Fogg and Passepartout travel the world on trains and boats, and even an elephant! Right from the start of the show there was audience involvement too, from someone being spoken to or pointed at, to actually being taken onto stage! It was hilarious. If you're unsure as to whether to take children to see this show I would say DO IT! Children (I'd say aged 7+) would be highly entertained as there's never a dull moment on stage. Watching Around The World in 80 Days was an experience, it wasn't just sitting there watching a play. We went on a journey too. Throughout the show I felt happy, sad, tired, tense, worried, and happy again. By the time the play finished I was exhausted and oh-so happy. The boys loved this play, and LP even came away with a souvenir which has prompted him to start a keepsake box! This is the best play we have seen in a long time. Do go and see it.